With the recent Hilton credit card deals that have been popping up (such as the Hilton Surpass Amex 100,000 bonus points offer and the 75,000 bonus points Citi Hilton HHonors Visa Signature deal), it seemed like a good time to compare the various Hilton co-branded credit cards. 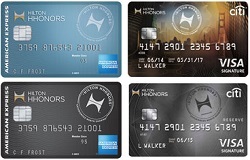 They include the aforementioned Hilton Surpass Amex and Citi Hilton HHonors Visa Signature card, as well as the Citi Hilton HHonors Reserve Card and the Hilton HHonors Amex. Which Hilton credit card is the best for you? Read on for our in-depth analysis. The following information represents the current, standard features of each card. It is sometimes possible to find limited-time promos that offer better signup bonuses than the amounts listed here. *AXON Awards – Available exclusively to American Express cardholders, AXON awards are awards for 4 nights. Sometimes they offer a better deal than standard awards. Only the Citi Hilton HHonors Reserve card does not charge foreign transaction fees. This is a very important feature for anyone who frequently travels abroad and quite frankly, it’s disappointing that the Surpass doesn’t have it. The Hilton Surpass Amex is the only card that has an airport lounge feature with Priority Pass Select, a benefit valued at $99. This benefit provides access to over 850 airport lounges around the world, subject to a fee of $27 per person per visit. In general, the Amex cards offer more points per dollar spent. The free weekend night certificate from the Citi Hilton Reserve card is extremely valuable, as it can be used at nearly any Hilton property. The certificate only excludes a small number of properties, which are all inclusive properties and roughly 30 so-called “distinctive” properties. As both of the Citi cards are Visas, another point to consider are the advantages and disadvantages in general of American Express vs Visa. With Visa, you’ll enjoy much greater merchant acceptance. You’ll also get access to exclusive Visa Signature benefits and discounts. On the other hand, Amex offers its own separate set of perks, such as Amex Offers. There’s also something to be said for having a diversified portfolio of cards, so if you already have a Visa but not an Amex, getting your first Amex might be more attractive and vice versa. When comparing the Citi cards, one benefit stands out: the Reserve’s free weekend night certificate. The free weekend night certificate is so valuable that as long as you spend the $10,000 needed annually in order to earn it, there is little reason not to get the Citi Hilton Reserve card over its no-fee counterpart. Why is the free weekend night certificate so valuable? Because you can use it at nearly any Hilton property with no blackout dates as long as a “standard room reward” is available. It’s possible, for example, to use your free weekend night certificate at a property that would otherwise cost 95,000 points per night. Your free night reward can be used even during peak periods when prices are exorbitant, towards rooms that would cost $500/night or even more. As long as you are slightly strategic with your certificate redemption, it should be easy to get enough value to more than offset the $95 annual fee. For similar reasoning, we prefer the Citi Reserve card to the Hilton Surpass Amex card. Unfortunately, ever since the big HHonors devaluation in 2013, AXON rewards aren’t particularly valuable anymore. And the 2 point per dollar difference in earning at Hilton properties (12 points/dollar vs 10 points/dollar) between the cards will be far less valuable to most people when compared to the value of the free night certificate. Add in the lack of a foreign transaction fee and the Citi Hilton Reserve comes out on top. In a world where 2% cash back credit cards are easily obtainable, a travel rewards card needs to have a good value proposition in order to compete. Unfortunately, the Citi Hilton HHonors Visa Signature and the Hilton Amex, both no annual fee cards, fall short. Even if we give HHonors points a generous valuation of 0.5 cents per point, the Visa Signature earns the equivalent of 3 cents/dollar at Hilton, 1.5 cents/dollar at supermarkets, drugstores and gas stations and 1 cent/dollar on all other purchases, while the Hilton Amex earns the equivalent of 3.5 cents/dollar at Hilton, 2.5 cents at restaurants, gas stations and supermarkets and 1.5 cents/dollar everywhere else. If we value HHonors points at a more realistic 0.4 cents per point, the cards look worse. Couple that with the constant fear of devaluation and the superior flexibility of cash back and we prefer cash rebate cards. So, as long as you spend $10,000 on the card, we would recommend the Citi Hilton Reserve over the other Hilton cards. If you spend less than that, you’d probably be better off with a good cash back credit card rather than one of the no-fee Hilton cards.